Partners: AntECO and other new SRPs. Antarctica is changing, and parts of it are changing very rapidly. Pressures on the Antarctic environment result mainly from global climate change, invasive species, human impacts, and extreme events. These stresses may be convergent, and their interactions can lead to threshold changes in communities, populations and individual organisms. 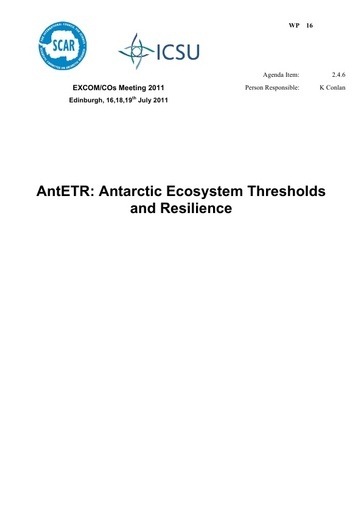 AntETR will examine the current biological processes in Antarctic ecosystems, to define their tolerance limits as well as thresholds and thereby determine resistance and resilience to change. Such ecosystem processes depend on a cascade of organismal responses from the genomic through cellular to physiological. Recent studies have shown that microevolutionary adaptation to the polar environment may constrain an organism’s ability to respond to environmental change. The extreme environment and marked difference in community complexity between the polar regions and much of the rest of the planet may mean that consequences of stress for ecosystem function and services, and their resistance and resilience, will differ from elsewhere. Polar ecosystem processes are therefore key to informing wider ecological debate about the nature of stability and change in ecosystems. What are the genetic underpinnings to the life history, phenotypic plasticity and physiological adaptations of polar organisms that determine their resilience and resistance to ongoing and future change? How do species traits impact on community interactions and stability and in turn influence nutrient cycles, energy transfer and productivity? Will invasive species have catastrophic impacts on these community interactions, and thus on ecosystem processes? What are the likely consequences of a changing environment for ecosystem functioning and ecosystem services provided by the Antarctic biosphere? How do changing biogeochemical cycles interact with and influence biological systems in Antarctica? In addition, AntETR will recommend tools to understand organismal physiology, systems biology and the drivers of productivity in the context of stress. Addressing these questions will encourage new capacity in the Antarctic community and combine bottom-up and top-down application of advanced approaches in situ, in the laboratory (e.g. ‘omics’ approaches) and in silico (e.g. process modelling and advanced database mining) to provide an integrative view of the vulnerability of the Antarctic biota. We will exploit the full range of Antarctic ecosystems from continental to sub-Antarctic, including marine, liminic and terrestrtial habitats and in a manner that facilitates a bipolar approach.